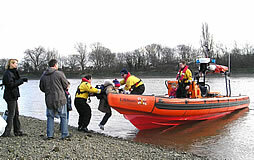 Chiswick Life Boat Station - is one of four RNLI lifeboat stations on the Thames which became operational in 2002, following the inquiries into the sinking of the pleasure cruiser, The Marchioness. The lifeboat has a mix of full time and volunteer crew. It is the second busiest RNLI lifeboat station. Certain parts of Chiswick near the river are subject to an extra risk of flooding particularly when there are exceptionally high tides on the Thames. The figures below shows the dates and times at which an unusually high tide is expected. This is defined as a tide height of 7.1m or above. Areas that may flood at these times include Chiswick Mall and the towpath at Strand on the Green. Some minor encroachment of the river on to the carriageway of Chiswick Mall may also occur during other high tides. The peak tides will occur a few minutes earlier at Chiswick Mall and a few minutes later at Strand on the Green than the times given below. This table is meant as a guide only. Some flooding may occur on other dates, tides can peak earlier or later than the predicted times, and actual tide heights will be affected by the weather (recent rainfall, atmospheric pressure and wind strength and direction). Hence no warranty is provided, and we cannot accept any responsibility for accident, damage or injury caused through the use of the tide tables.